You will love the open floor plan and private setting of this house in Brevard. 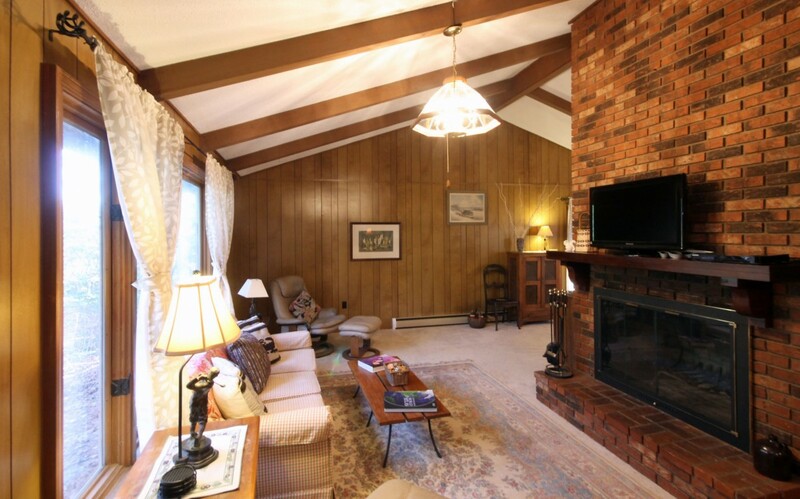 The fireplace and TV are located just around from the dining room and kitchen. The kitchen has everything you need. The dining area seats six, and the sliding glass door to the left opens out to a screened porch where you have additional seating. 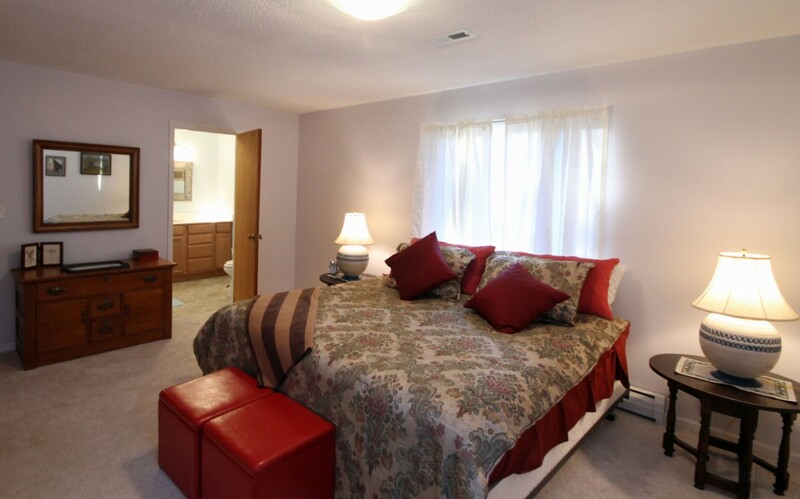 The Master Bedroom features a king bed and a comfortable seating area. We have two twin beds in this room. It's cozy and inviting! 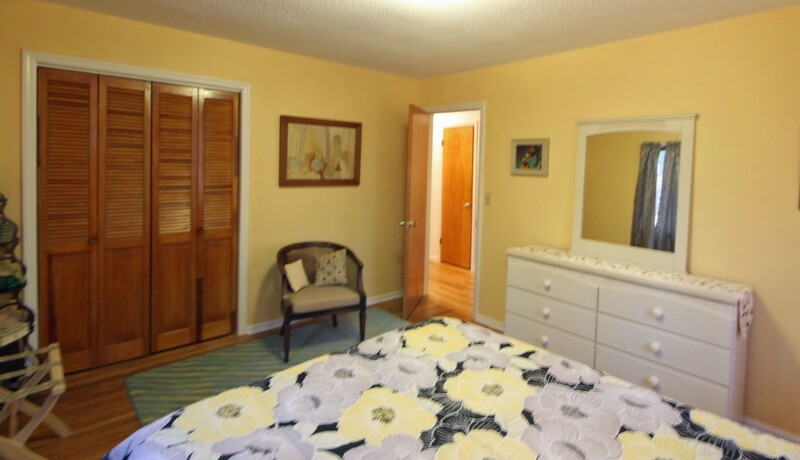 The guest bedroom is sunny and bright, and features a queen size bed. 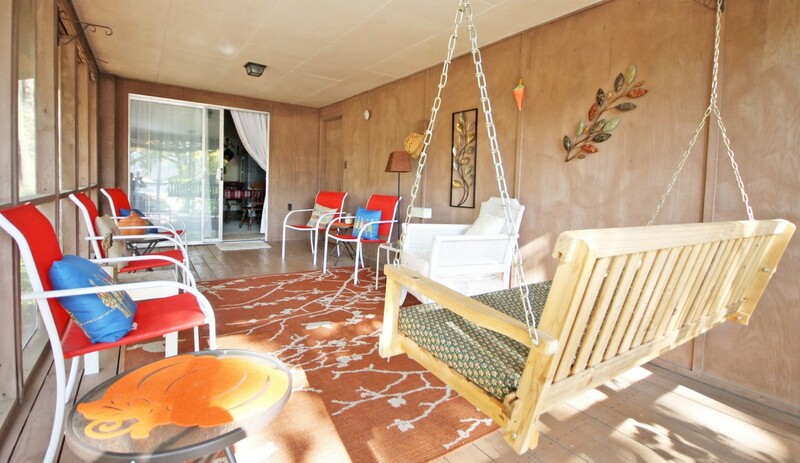 The Screened Porch is our favorite place to relax, unwind and entertain. 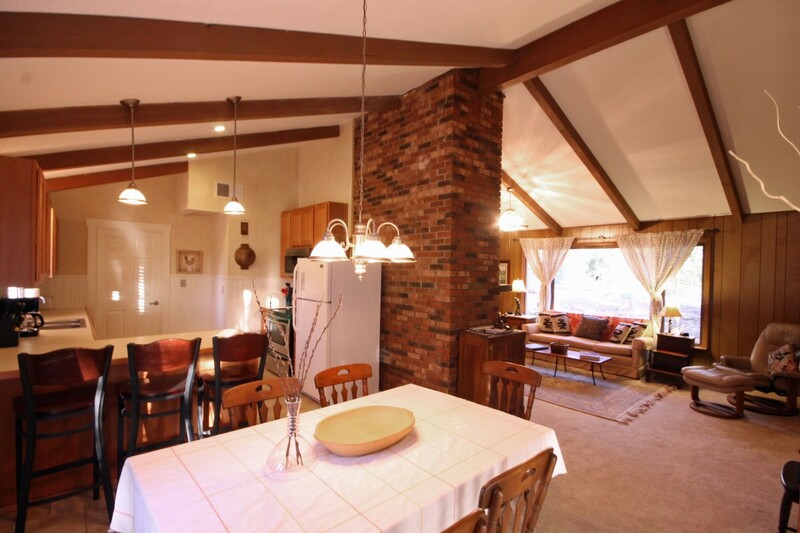 Here you can get a sense of the open floor plan and high ceilings. It's a great place to relax and entertain. 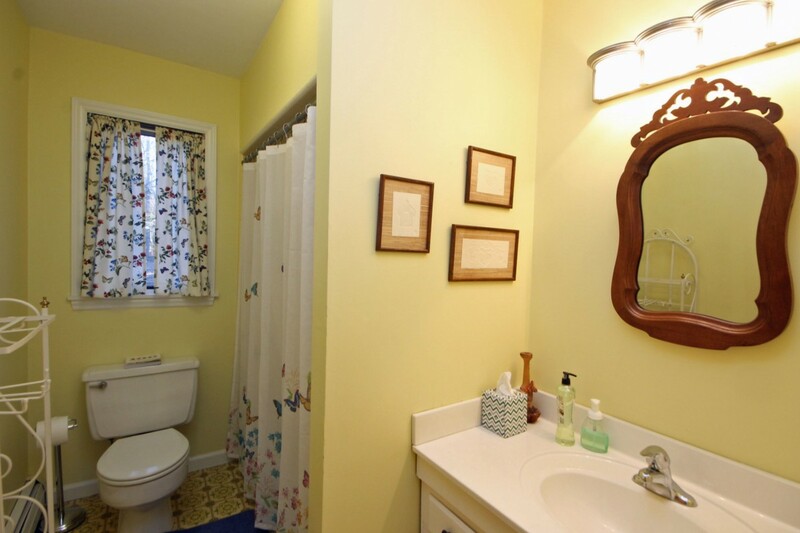 This roomy master bath is adjacent to the master bedroom and is a nice private room. This is the second bathroom at the end of the hall, and it serves the two smaller bedrooms. Here you can see the living room looking down the hallway. There is a big window on the right that gives the room plenty of light and a nice view of the woods. Here you can see the master bedroom looking toward the bathroom. Lots of space to relax and unwind. 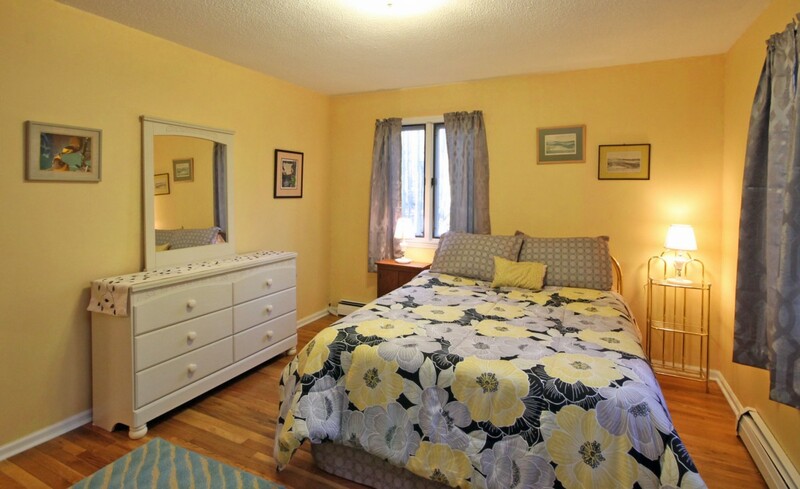 Another view of the guest bedroom, with its cheerful yellow color scheme. Looking from the dining area into the kitchen. 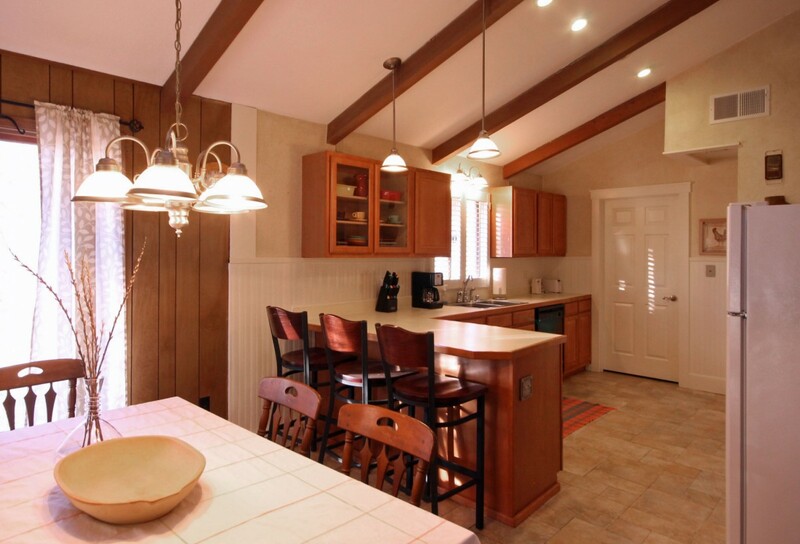 You can get a good look here at the high ceiling over the dining area in this view from the kitchen. Looking back toward the living area. The dining area is to the right. Looking back out toward the entry. Looking out toward the entry. Another view of the kitchen. The doorway in the back leads to the laundry area and pantry. Looking out toward the front window. 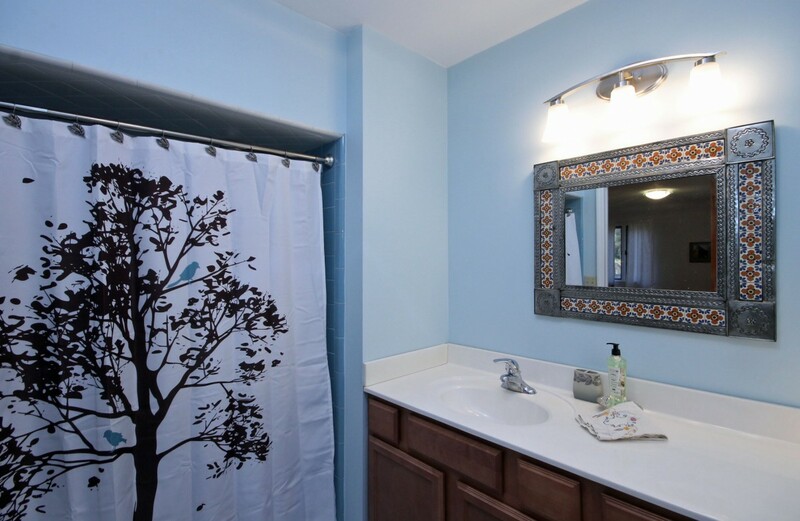 A nice view of the decorative shower curtain that graces the master bath. Another view of the twin bedroom, looking back toward the entry. Come enjoy Brevard and relax in this beautiful private home. We love this place and in fact we used to live here. The home is situated on a big piece of property that includes a large wooded area that provides a buffer from the surrounding homes. This peaceful setting is perfectly located between downtown Brevard and the entrance to the Pisgah National Forest. The home features a beautiful high ceiling in the living room and the dining area that extends into the kitchen for an open, connected feeling. It's a great place to sit, relax and entertain guests as you cook and enjoy the comfortable seating in the living room. A sliding glass door opens out to the screened porch where the party can continue. It's the best setup you can find anywhere in town. 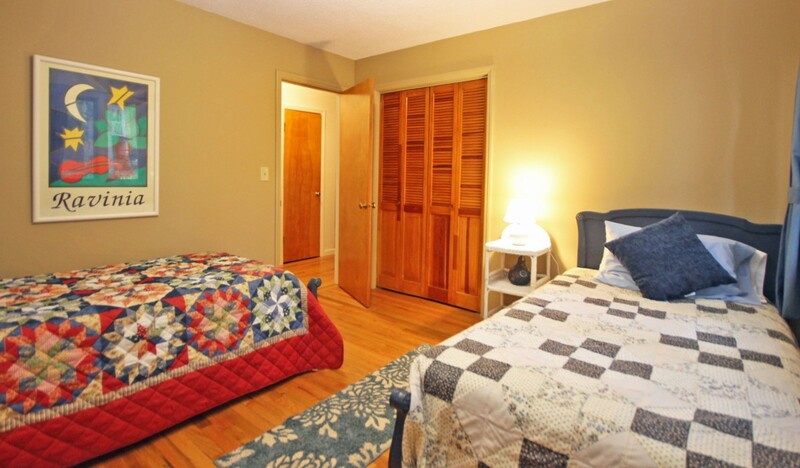 The bedrooms are cozy and private, and are situated on the opposite end of the house. The master suite includes an adjacent bathroom for privacy, and the other two bedrooms share the bathroom at the end of the hall. The location of this home couldn't be more convenient and it's perfect for anyone who is interested in cycling. The beginning of the Brevard bike trail runs along the edge of the property so you can easily access it. The trail leads right into Pisgah National Forest so you can ride there, approximately 3.5 miles to the Forest entrance. It's a nice ride and a good paved trail the whole way. It's an easy walk downtown but the sidewalk doesn't start until you go about 100 yards back toward the main road. So most people make the short drive up the hill to the downtown area. Alternatively you could drive across and park in the Ingle's supermarket parking lot and walk from there. Check out the shopping, dining and scenery as you walk down Main Street. Be sure to check out The Proper Pot, a great kitchen store that also sells wine, cheese and other yummy snacks. Another favorite is Main Street Ltd., a great gift shop right next to Quotations Cafe which is known for the occasional patronage of Steve Martin, a seasonal Brevard resident. Of course, Brevard is home to the renowned Brevard Music Center, and is also host to annual festivals including the White Squirrel Festival every Memorial Day Weekend, great 4th of July festivals, the Mountain Song Festival every September, and lots of fun activities on Halloween (Brevard is in Transylvania County, after all). We are right across the street from the Porter Center, which is the performing arts venue for Brevard College. We are five minutes from the Brevard Music Center, home of the Mountain Song Festival and many other exciting musical events throughout the season. You can get to Pisgah National Forest in about five minutes, the DuPont State Forest is about a 15 minute drive, and it takes about 30 minutes to get to the beautiful Gorges State Park. Asheville and Hendersonville are both about 40 minutes away, and both feature lots of attractions if you want to take a day trip or two. If you're house hunting, be sure to give us a call, as we are a full service real estate brokerage. Our clients love the boutique approach, as we work almost exclusively with our guests, and they get our full attention. We manage lots of vacation rentals so please feel free to ask questions about that if you're interested. We look forward to hosting your visit. Please feel free to book online or call if you have any questions. Thanks and enjoy your stay in Brevard! The inside of the home was very clean and it had a convenient location. The outside looks a little out of repair and frankly scared us about what we would see inside when we first pulled up. The property management team was great! The owners has some exterior work scheduled in the spring. Our priority is to make sure the interior is clean and comfortable. Especially like the location and size of the home. Screen porch is a plus. Internet works great and is fast. Outside of the home is a little disappointing in appearance. Home is well equipped.Linens are first class. Street is busy at times but it is best to use the circle drive entrance. We certainly enjoyed our stay. The property was very clean and accurately described in the rental information. There were a few problems with the locks and toilet, but Pete Key rentals took care of our concerns promptly and completely. We could not ask for better service. 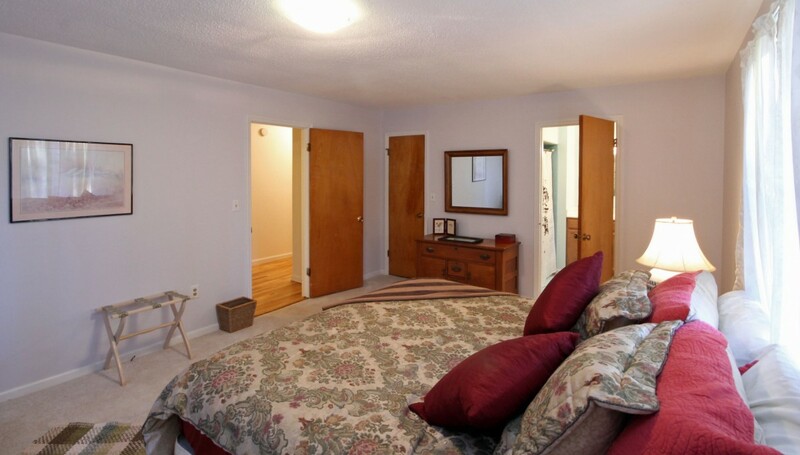 We enjoyed the location, just a block from Ingles and within walking distance to town. We, however, chose to drive to town. The outside of the house needs attention, but the inside (which is much more important) is open, airy and clean. 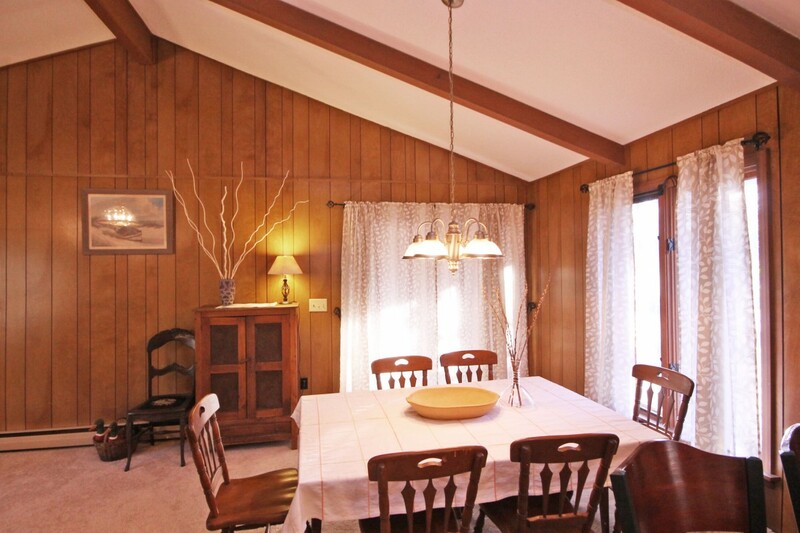 We loved the high ceilings in the main rooms and the screened porch. And this is a haven for "white squirrels". As soon as we drove up in the drive way, a white squirrel was there to great us. We were in Brevard about 10 years ago for a month and NEVER saw a white squirrel. Here we saw them daily...a real treat! I cooked many meals in the kitchen and found it to be very well equipped. The only drawback of the house is that it is hidden in the woods with lots of trees all around. This tends to block the sun, even on the sun porch. All and all, we really enjoyed our stay and would probably rent it again upon returning to Brevard. We are so glad that you enjoyed your stay and that you got to see the white squirrels. The home was centrally located to many amenities in Brevard. It was clean, very large, had everything we needed. We discovered the bike path almost too late to enjoy it. An added plus was the light show the lightening bugs put on for us and the resident White squirrel! Had a great time. It sounds like you had a lovely summer stay at the house. We are so glad that you enjoyed your time there and even saw a white squirrel. 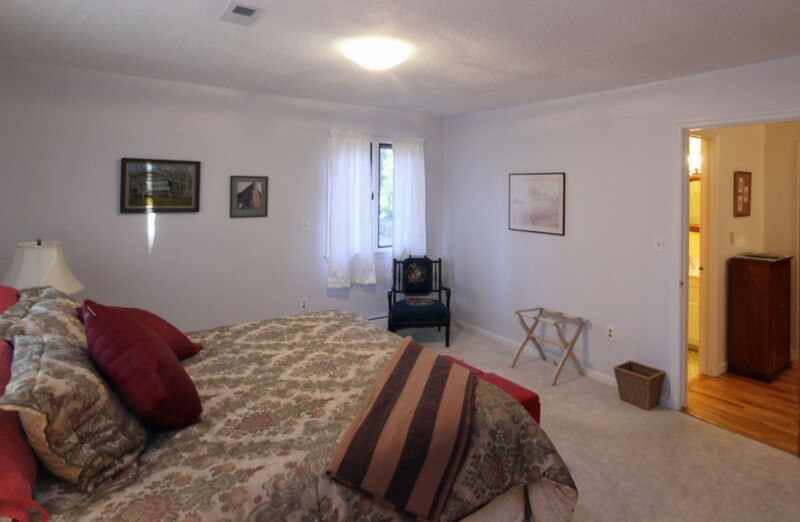 The property was clean and comfortable and convenient to Brevard. There is a white squirrel that apparently lives on the property. I saw him every morning while drinking my morning coffee on the nice screened porch. My biggest complaint was the cable tv. This was the poorest channel choices I have seen in a rental property No news channels like Fox or CNN, no ESPN, just the SEC channel. Also there is only a living room TV, none in the bedrooms. Fortunately, we were out sightseeing most of the time, but still..
We are so glad you enjoyed your stay. The property is ideally located in the city of Brevard. 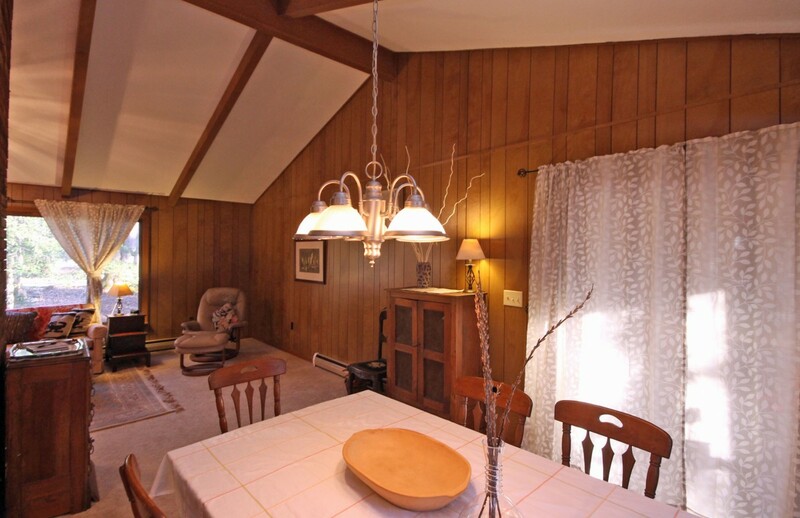 The home is located on a large woodsy lot with forest like landscaping. Restaurants, grocery and shopping are nearby. The driveway is located on a busy street when school is in session and can be bothersome when entering or leaving the property. There is a circle drive that can be used to help ease the problem. The home is spacious and well equipped. The bedrooms are large and clean but the beds were a little soft for our liking. The linens were first class, large, fluffy and absorbent and seem to be very recently placed for guests. A screen porch makes a nice place to sit and view the wooded lot and local mascots of white squirrels. Renting and entry to the home was easy. Wifi was great. TV selections were basic service. Housekeeping was prompt if anything was needed. We are glad that you enjoyed your stay. We encourage guests to use the circular drive anytime to enter or exit the property. Thank you for renting. We are glad you enjoyed your stay. I was very pleased with the accommodations of this home. Thank you for renting the house we are glad that you enjoyed your stay. We had a wonderful stay. The house is everything we needed and felt like home. We didnâ€™t use the kitchen but the other common areas we did use. The beds were comfy and the showers clean. Thank you for the use of your home! Thank you for staying we are glad that you enjoyed your stay. I came here with my boyfriend as well as 4 other friends! This place offered a wonderful place in a perfect location! Only 4 minute drive from the free parking lot where all the cute Brevard shops are. Unfortunately on our last night it got really icy and we were not able to get to our proper destination for New Yearâ€™s Eve in Asheville. But because this property is so close to town we were able to get into one of the Brevard locations without having to struggle with the dangerous roads that night! The kitchen area is bigger in real life than what I think these pictures show, which was awesome for 6 people trying to make breakfast every morning. Plenty of seating area! A lot of board games to play! My one complaint is that there seemed to be no wine glasses! But that is not too huge a complaint as wine drinks the same in every glass. Oh and best yet, Ingles grocery store is only about 2 minutes away! Basically across the street almost! We are so happy that you enjoyed your stay. Also how great that you where still able to enjoy New Years Eve even with that terrible ice storm. We hope that you can come stay again. This property was perfect for a short stay in the fall. The log fire was a real bonus - worked really well and provided a lot of heat. The home is much as it appears on the pictures, with all you would need for simple meals in the kitchen, and comfortable beds. The place was clean and there were starter packs of detergents, hand soap and so on. We had one small problem when we were there and the agent was quickly responsive and helpful. We are glad that you where able to enjoy the fireplace it really makes the colder weather more cozy. Thank you for staying! Everything matched the pictures on the web site. The house is very close to town. You can walk to a lot of places but it's on a busy street. Very easy bike ride with the city path 1/2 block away. We were there for mountain biking. You can ride your bike to Bracken Mountain trails. You can also ride to Pisgah on the city trail. It's not a direct route but it's scenic. DuPont is 20 minutes away. Everything in the house was clean and in good working order. I would rent this house again. We are so glad that you enjoyed your stay. The mountains are so beautiful in the fall it's the ideal time to mountain biking and hike. Overall this home met our needs perfectly. We especially appreciated having a garage since we had our bicycles. The home was very convenient to stores, restaurants and downtown Brevard. Our only dislike was that McLean is a busy road so we were displeased with the high amount of traffic. However, we recognized it was part of having the convenience of being in town. We had a little bit of difficulty with the BluRay player, but other than that everything was great. Fortunately the small town of Brevard really doesn't have much traffic and the location is great for exploring the National Forest as well as all the shops and restaurants in town. Thank you for renting the house. We were very pleased with the vacation home. The house, including the kitchen, was well stocked and clean, The beds were comfortable. The location could not have been better for our weekend at Brevard College Homecoming. The weather was perfect to enjoy the lovely screen porch. We would recommend this house and will definitely stay here again. We are so glad that you all enjoyed your stay. We look forward to hosting you again. The space was great. Plenty of room to spread out and be comfortable. The house was nicely equipped and clean. The screen porch was nice too. The outside is not much to look at but the house and its big open space worked well for us. My only complaint is that although the house is listed as "non smoking" it has clearly been smoked in. Each time we returned to the house the odor was very strong. So that was disappointing. This house is a non smoking home. Unfortunately it sounds like the guest before you did not follow that rule. We had our cleaning lady air it out and run an ozone machine to eliminate the odor. We apologize that affected your stay an wish that you would have let us know so we could have fixed the problem during your stay. We hosted a family reunion. My niece and husband loved the location and layout of the house. She took photos of the deer that past by the porch. We live near McClean road. It turned out to be very convenient to have them close. The house was neat and clean. We will be renting the house again. We are glad that the house worked out well for your family reunion. Thank you for renting it for your family. We enjoyed the home and Brevard. It was super clean inside and nicely furnished. The outside needed a good power washing and some maintenance. Thank you for staying. We just had a big yard and garage clean up and some outdoor maintenance. This property is in a great location, close to downtown Brevard, plenty of walkable shopping and activities, and convenient for getting to Pisgah National Forest. There was an issue with the hot water heater, which the mgmt company took care of in 2 hours... great service!! The space worked well for our party of 4 adults and 2 kids. 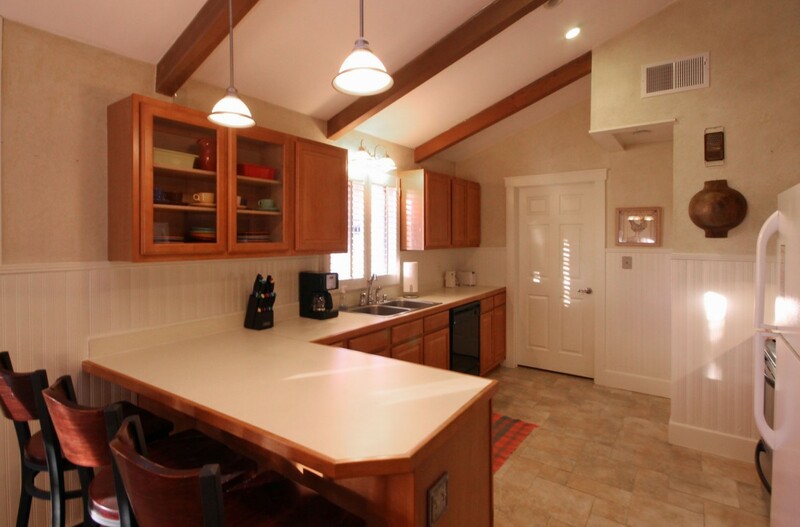 Spacious kitchen and screen porch made it easy to live there! The owners are doing ongoing renovations to this older property, and while it's not fancy and has a few quirks of a mountain home (watch for poison ivy), we would definitely choose it again next year. Thank you for renting the McLean house. We hope that we can have you back next year. It is a perfect central location for exploring both downtown and the forest. So glad that it worked well for you during your time in Brevard. Quaint home with comfy beds and the perfect size for our family. Nice, well-stocked kitchen. Very clean and well-maintained house. Loved the large window in the living room! We were able to walk to downtown for the 4th of July festival, which was great! Visited the hatchery with our youngest, who loved seeing the fish. Also enjoyed kayaking on the French Broad - so beautiful! Don't miss Mayberry's (baked potato salad) or the Brevard Brewing Co. It sounds like you all had such a wonderful time during your stay in Brevard. Thank yopu for staying we hope you can come again. Comfortable house close to downtown town Brevard. We are so glad you enjoyed your stay in Brevard. Thank you for renting. This home was perfect for us! It's clean and well stocked! Close to everything and within walking distance!!! It's perfect for the Assault On the Carolinas! Or any vacation in Brevard! We are so glad that you enjoyed your stay in Brevard. The house was everything they say it is. We stayed May 3rd through the 11th. We had 6 in our group and there was plenty of room all the beds were wonderful, never ran iout of hot water. Location is amazing for any activity. I hate leaving a good review just because we might not be able to rent again if everyone finds out how wonderful this place is . Thank you for staying! We look forward to having you back. The home was perfect. Very accessible to down town, right across the street from a grocery store and just around the corner from Blue Ridge Parkway access. Very easy check in and check out. Thank you for renting the Montview house. We are glad that the location was so convenient and that you enjoyed the wedding weekend in Brevard. Myself and a friend come to Brevard each spring to ride road and mountain bikes. This year we had a couple more guys want to join us, so we needed a bigger house. This one looked like it would fit the bill. Brevard's a cool town near great riding. The locals are friendly and there's a great vibe in town with plenty to do off the bike. The house had 1 master suite with king bed, 1 guest bedroom with a queen bed and a bedroom with 2 twins. Really only room for 4 unless you have couples. Everything else was great, cable, wifi, full kitchen, laundry, dining room and a screened porch and 2nd bathroom. It also has a garage, which was nice for stowing bikes. It's within easy walking to downtown and the grocery which is great if you car-pooled with friends and plans diverge. We'd rent the house again if it's available. It's a cool little house in a nice wooded setting right off one of the main streets. It is a stone's throw from the bike path that links a lot of the town too, so you can ditch your car in many instances if you're there to ride. The level of finishes in the house wasn't the Ritz, but it was super for a week where we spent most of the days riding mountain bikes then cleaned up, went out for a few hours in the evening and crashed for the night. How wonderful to hear that you had such a great stay in Brevard. The house is in the perfect location for folks who are coming to town to enjoy the forest and mountain biking as well as all that downtown has to offer. We would be happy to host your stayagain anytime! Thank you for spending your Thanksgiving holiday at the house. We hope that you can come stay again. We love the house on McLean and are glad that you did as well. The location is so convenient to both downtown and Pisgah forest. We hope you can come back in th warmer months and enjoy relaxing on the screened in porch. My mother and I came to Brevard for the fall season after being there in the spring. We loved this little cozy house. Great price and close to town. We were a little disappointed to find out that a lot of the stores closed so early so we missed some good shopping, but enjoyed coming anyways. Thank you so much for renting the house. We hope that you can come stay again. This house is in a great location! A short walk up the hill to downtown, There is a grocery store within a minutes drive, and lots to do within a 10 to 15 minute drive. House could use a little updating but overall was clean and it suited our needs very well. Kitchen has everything you need. We even grilled out one night which was nice to do. We will look to rent this location the next time we vacation to Brevard. We would be happy to have you back again anytime. Thank you for renting the McLean house. Great cottage, great location. Our family of 4 stayed here for the 4th of July weekend. It's walking distance to the college, the grocery store and College Walk retirement community, where we visited relatives. The house feels very homey -- like visiting family. It was clean and kitchen was well-stocked. The screened porch is delightful. We are so glad that your family enjoyed your stay. The home was clean and inviting. It was in a nice location close to town. I got a call from Pete Key to make sure everything was okay. It was a home away from home! Will be renting again! We are glad that you enjoyed your stay and hope that you can come again soon. 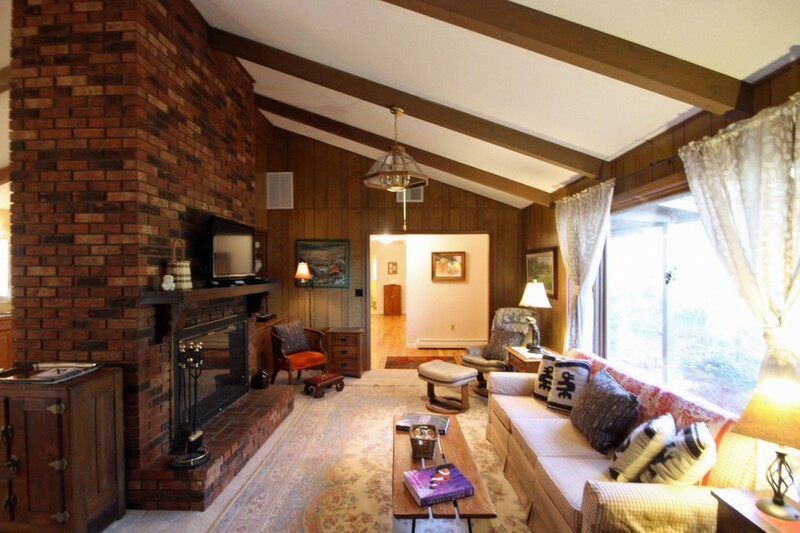 This home is clean and well stocked in a wooded setting. It is in a great location to explore the town and Pisgah National Forest. Many great hiking trails and waterfalls within 15-30 minutes of the home. The town is a short 3-5 minute drive. Would recommend replacement of the bathroom flooring but overall a very pleasant experience. Really enjoyed the screened sunporch! Hope to visit again and get a glimpse of the white squirrel! Thank you for renting the house. WE are glad that you enjoyed your stay and hope that you can come again soon. We are so sorry that Vrbo was repeatedly asking you to leave a review. We do appreciate you renting the house and are glad that you enjoyed your stay. We had a great stay here. The house was so cute and comfortably furnished. It was the weekend of the White Squirrel Festival and parking in town was a nightmare but we could easily walk. I loved the screened porch, perfect spot to hang out. Dinner at Jaime's Bistro was as usual perfect. I can't wait to come back and will defiantly try and rent this house again. Sounds like you had a wonderful stay in Brevard. Thank you for renting from us. Good location, close to downtown to ride your bike or walk. House has a garage which was great for taking care of our mountain bikes after riding all day. Close to DuPont and Pisgah. My only issues were the kitchen is very poorly stocked for anything more than very basic cooking, and the house needs some updating. Overall Very comfortable, and did the job. This house is a great place to stay if you are coming to enjoy hiking and biking in the area. The kitchen is set up with all the basics you need for cooking. If you find yourself in need of a specific kitchen utensil just let us know and we are more then happy to accommodate. Thank you for renting from us. We enjoyed the stay, great part of town and close! The home was clean, comfortable, and roomy. We enjoyed the natural landscaping of native plants and even caught a glimpse of the elusive white squirrel! Would definitely stay again!